Children in West Java, Indonesia, proudly show their clean hands and teeth after washing them at a special table developed by Bruce Walker, '91 DDS, and other collaborators. As Ohio’s only state-supported public dental school, the College of Dentistry takes seriously its responsibility to educate the next generation of dental professionals who can then go into communities to help expand access to care. And, from rural towns and urban centers in Ohio to remote villages worldwide, College of Dentistry alumni are making a difference. This is a look at two alumni serving abroad. Although they are working in different capacities, these dental professionals were led to their adopted communities by the same motivation: a desire to make a lasting impact for people in need. Originally from Mansfield, Ohio, Tim Bartholomew, ’96 DDS, didn’t want to work in a factory as his parents did. His brother, Terry Bartholomew, DDS, graduated from the College of Dentistry in 1994, and he decided to follow in his brother’s footsteps. After hearing a lecture by faculty member Rick Scheetz, ’80 DDS, ’85 MS, Dr. Bartholomew decided to specialize in oral surgery. Following graduation from the College of Dentistry, he completed an oral surgery internship at Loyola University and residency at Virginia Commonwealth University School of Medicine. Subsequently, he did fellowships at the Oral Surgical Institute in Nashville, Tennessee, and at the University of Miami. Then, he prepared to go to Africa. Dr. Bartholomew spent the next year collecting instruments from donors, raising financial support, and learning French. Afterward, he spent more than two years in Gabon and Niger, West Africa. 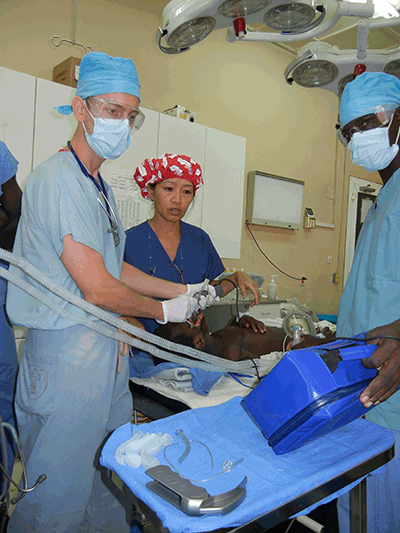 Sponsored by several churches and also by about 15 individuals, Dr. Bartholomew and his wife, whose training in anesthesia makes her an ideal surgical partner, have lived and practiced in the West African countries of Cameroon and Mali. Now that they have a child, the couple plans to move to a sub-Saharan African country where there are better educational opportunities. Dr. Bartholomew also maintains his ties to home by coming back to Ohio in the summer to do locum tenens work and by working with the college's Division of Oral and Maxillofacial Pathology and Radiology to have microscopic diagnoses for tissue biopsies done for many of his difficult cases. 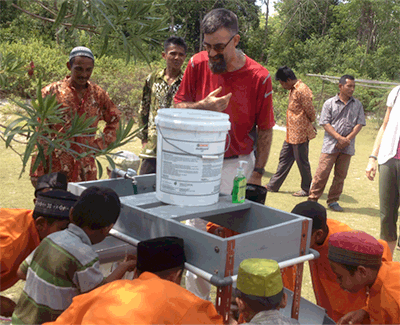 Like Dr. Bartholomew, Berea, Ohio-born Bruce Walker, ’91 DDS, thought that God was calling him to do humanitarian work oversees. After practicing in Delaware, Ohio, for 11 years, he and his wife, Sonya, who earned a medical degree at Ohio State, packed up their three small children and moved to West Java, Indonesia, where they had friends. on the importance of clean hands and teeth. “Originally, we thought we’d stay in Indonesia for three or four years, but it’s now been over 14 years,” Dr. Walker said. “When we arrived, I thought I would work in the dental school, but it turned out my time was better spent working with the Department of Education influencing what was causing dental problems. I found out the number one reason kids weren’t attending school in West Java was because of dental problems, accounting for 61 percent of absenteeism, according to statistics collected by the government. “There are several reasons for the problems, but two top ones are the lack of the use of fluoride and overexposure to processed foods. A toothache so affects your ability to concentrate. Their parents, who have also experienced dental pain, have empathy for their kids and keep them home. “I knew of a colleague in the Philippines, Dr. Bella Monse, who was implementing a program to promote daily hand washing with soap, daily tooth brushing with fluoride toothpaste, and the use of deworming medication. I contacted her to discuss how this strategy could be implemented in Indonesia. Dr. Walker said that providing a mass hand-washing facility or table and stocking it with soap, toothbrushes, and toothpaste cost $2.50 per child the first year. After that, with a facility in place, the cost per year is reduced to 50 cents. “The kids never take the toothbrush home. It stays at school with their name on it. Each year, the kids get a new toothbrush. The first year, we provide the toothbrush, toothpaste, and soap. After that, we ask the parents to buy the materials. Dr. Walker plans to remain in Indonesia for at least three more years. His youngest child will graduate from high school at that time, and he and his wife will then decide what to do with the next chapter of their lives. Having maintained his licensure in Ohio, Dr. Walker likes the idea of coming home one day to practice or perhaps to teach at the College of Dentistry.